Welcome to your own self contained top floor two bedroom suite with private entry. Comfortable queen sized beds, a kitchen with plenty of counter space, private laundry, digital cable + movie channels, wireless internet, all the amenities of home and much much more. With these panoramic ocean and mountain views, huge private rooftop patios, windows at every turn, an inviting fireplace, a big screen TV. and a 47 jet therapeutic hot tub it won't be hard to relax and enjoy this vacation! After your long day of indulging in Victoria wouldn't it be nice to escape to your own private rooftop terrace above the treetops and soak in the breathtaking views of the Olympic Mountains and Juan de Fuca Strait. Ocean-Aire Vacation Suite offers you that and so much more. This two bedroom suite has it all! A cozy gas fireplace to snuggle up by, a soothing hot tub to unwind in, sun drenched decks to sunbathe on, a big screen television to catch the latest flick, a kitchen designed to entertain in, comfortable beds that make it hard to leave and astounding views everywhere you turn. And here at Ocean-Aire Vacation Suite we are only minutes to beautiful beaches, parks, trails, golfing, dining, recreation, shopping, transit and so much more. We are just ten minutes from the heart of downtown Victoria and twenty minutes to the airport and ferries. There are two flights of stairs to reach the suite. Guests with difficulty climbing stairs may which to inquire about our ground level suite. This property is also family friendly. I placed much hard work in renovating our home and have placed much effort to making a perfect vacation suite that would make the most of the views that it has. We have been relay lucky to find such a great neighborhood within Victoria. We loved this hidden gem of a neighborhood that we found, and also the beautiful views of the mountains and ocean from the property. We enjoy all this neighborhood offers within walking distance, a recreation centre, a library, grocery stores, various shops, restaurants, a kids play park, and a short walk to Saxe Point park on the ocean. The large decks provide a good deal of enjoyable outdoor space, with a wonderful view of the ocean and mountains. This is a very safe and friendly neighborhood that is centrally located. Suite has a sweeping view of the Olympic Mtn range from the large decks, along with views of the water. The esquimalt village area has every convenience imaginable and all within 5 min walk (grocery store, pharmacy, bakery, cofee shop, restaurant, rec centre, library, liquor store, bank, and much more). One parking spot is available on the property, and additional parking for a second vehicle is available on the street at no charge. A shared back yard is available to the suite. A 9x18 pool and deck area is accessible to this suite, shared by another suite and owners. The views and the location of this property were excellent. The layout worked well for us, and there were lots of amenities within an easy walk. However, there were many maintenance issues that made our stay less than perfect. When we arrived we found a note from the previous guests that the toilet had been broken since early in their stay. I emailed the host but never received a reply; we ended up having to make a temporary repair to the toilet ourselves. The grill was almost unusable due to broken burners and decaying grates, and the microwave door was very difficult to open/close correctly. The pull-out couch is so uncomfortable that I think it would impossible to actually use it as a pull-out--fortunately we only had five guests so one of us slept on the couch without using the pull-out. There were lots of other little issues that made the unit feel like it hadn't been cared for. Several multi-bulb light fixtures had only one bulb working. The yard of the ground-level unit was full of garbage and broken toys, which didn't really affect us but contributed to the general feeling that the property was being neglected. 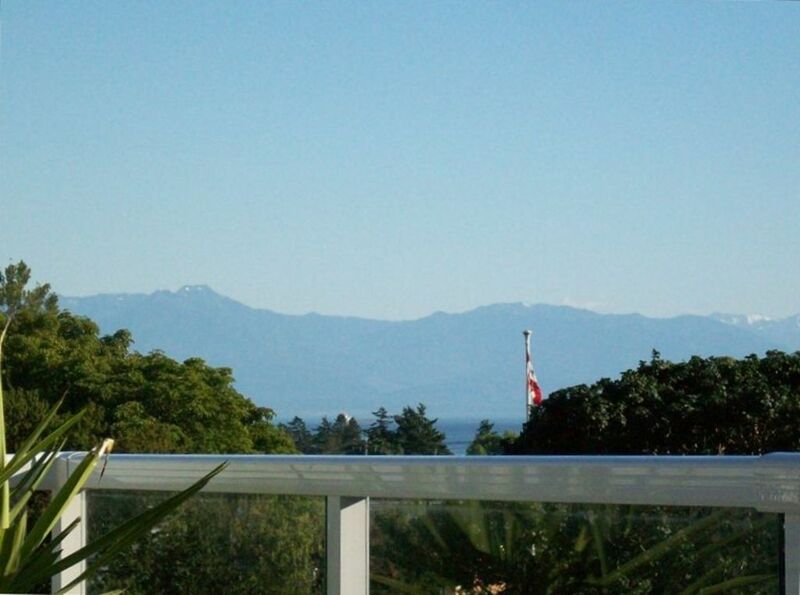 Overall the location was great, with easy access to downtown Victoria, and the decks offered fantastic views. With a little care, this place could be stellar! The deck has nice views. It's good value for the price. Easy access to downtown just 10 min away. There were a few minor issues that the owner took care and of right away. My family and I enjoyed staying at this property. There are a lot of stairs, but the suite is a good size and the deck is huge. 7 of us (3 adults and 4 children) spent a weekend and had more than enough space. Would stay here again. Good location and pet friendly! We enjoyed our stay at this suite. It is conveniently located in Esquimalt. Being pet friendly was a huge plus for us especially having the grass area on the upper level. There is a lovely view up top but unfortunately we stayed in March so wasn't able to enjoy the deck area but would be a lovely spot in the summer to hang out. The suite is neat and quiet at night. The only downside is the trek up the outside stairway to the entry door and then the flight of stairs inside the unit. We were pre warned about the stairs but we had lots of groceries and luggage to pack up to the suite. Overall our experience was good, the owner was friendly and answered my email questions promptly. We would stay here again. We stayed for January and February. This unit was perfect for us. We love to cook, entertain and this condo was well stocked and laid out great for both. Close to stores and a nice walk thru park to bus stop. The views and sunsets from the decks were awesome. Nic and family were very gracious hosts and quick to respond to our needs...which were few! The property on the inside was accurately portrayed by the photos. It is a small space with all the basic amenities, furnished very inexpensively with Ikea furniture. The pull out sofa bed mattress was very thin, you could feel every coil, very uncomfortable for sleeping. A foam mattress topper would be a nice addition. The bedroom pillows in both rooms were very thin and lumpy they all need replacing. The biggest disappointment was the outdoor living space. The pictures do not accurately represent this space. There was no hammock, no umbrella, and the deck was filthy. I get that trees drop leaves and that the deck needs to be swept frequently but it was much more than that. The glass table had not been wiped down at all and had a huge sticky spill on it along with bird droppings. The cushions were covered in dirt and bird droppings it was really bad. The glass balcony railing was so dirty you could hardly see through it. The hot tub was hardly accessible do to dirt and debris around it. Not a garden oasis by any stretch. Overall a big disappointment. I will say the owners were easy to deal with and the location is very accessible to downtown. Firstly the guest did not indicate any of these issues during their stay, and reading this reviews the first I’ve learned of these concerns. For any guest who is not satisfied with the cleanliness of the suite, we are more than happy to provide for additional cleaning at our cost. We are also always just one call away and will put every effort in making it right for our guests. This is the first complaint regarding pillows or the pull out couch that we have had. We will be looking at replacing the pillows. The pull out couch mattress is of the standard variety, we will look if there is anyway of improving the comfort it can offer. The hammock on the deck has been replaced with a lounge chair, we have just not had time to update the photos online for this change. The umbrella was misplaced and has been relocated and is back on the deck. The glass railing looks like it could use a bit of a clean but was far from making it hard to see through. Our cleaning service is supposed to sweep the deck of debris and clean the patio table and chairs. I will be taking this up with them as to why this was not done as required. The hot tub is the same as shown, the pond area has recently been removed and the entire front yard landscaping has been redone. The majority of the work should be completed by end of this month. The hot tub is now in a more private setting with a more functional sitting area, and there is a clear path to access the hot tub area. There may have been an occasion were work was ongoing during the day when some items were placed in the path, but this would usually be of short duration as we endeavor to keep the path clear at all times. Also this project will deliver added amenities such as a sauna and pool, which will be posted in more detail once they are fully installed. Have the best of both worlds! We are just a 10 minute drive from the bustling activity of the heart of downtown Victoria yet located in the quiet historic community of Esquimalt, place of shoaling waters. Still part of the Capital Region we are only a short stroll from parks, beaches, shopping, dining, transit, rec centre, library and so much more. Pet fees and extra person fees have weekly discounts as for longer stays can be negotiated.